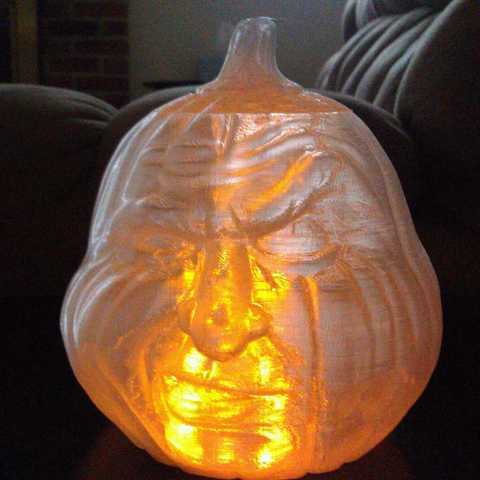 I printed Steve Campbell's excellent Grumpy Pumpkin model. When I showed it to a friend, he said, 'that would be really cool if you could put a light source inside'. So, I split off a little bit from the top. Also a few mm off the bottom to let it sit flat on the BP. It was printed in colorFabb XT transparent copolyester material at 200 micron step. There were overhangs that didn't fill in completely, but it still looks pretty great. This would be equally awesome in white with colored LEDs on the inside or GITD with UV LED. Print the bottom as a vase. Print the top with about 7% infill or so to get a nice fill.